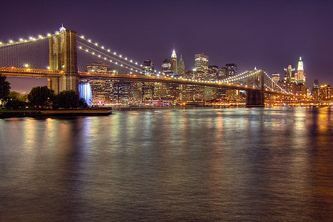 The Brooklyn Bridge is a hallmark in American invention and creativity and is known as the 8th wonder of the world. At the time of its construction, the Brooklyn Bridge was the longest suspension bridge in the world with a span of from pier to pier 1595.5 feet. The towers are 270 feet high and the roadway is 135 feet above mean tide-water, which allows boats of less than 1,000 tons to navigate beneath it. The bridge is 85 feet wide and is supported by 3,578 feet, 6 inch long wire cables. Roebling's genius in the supension design of the Brooklyn Bridge allowed it to be long enough to connect New York City to Brooklyn, high enough to rise over the mast of ships, and strong enough to withstand the fierce gales of the Atlantic. Roebling used steel cable to design a suspension bridge to replace the rigid chains and rods previously used in bridges. 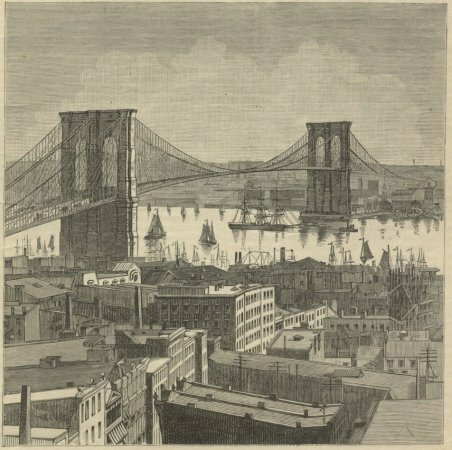 Roebling also used innovative bridge building techniques, such as erecting towers with a nomadic caisson method and anchorages for securing the wire cables. 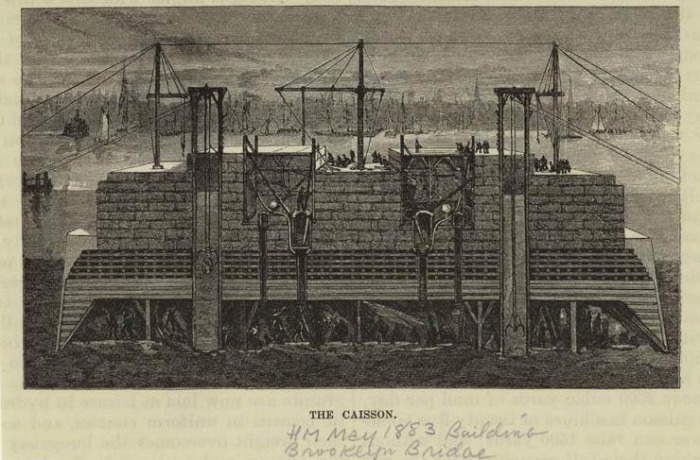 Caissons are large wooden boxes that serve as the foundation for the bridge's two towers. 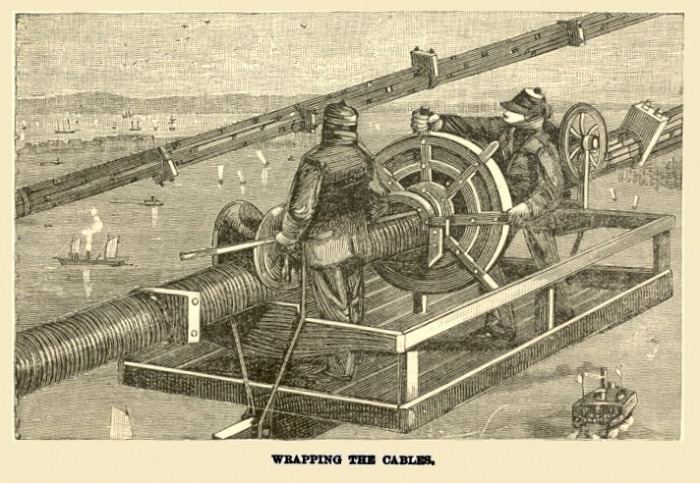 The caissons were filled with compressed air when the workers entered them. Inside the air lock of the caissons, workers known as "sand hogs" dug out the mud from underneath the river until they reached solid bedrock. From here, the caissons were filled with concrete and the foundation was completed for the towers. 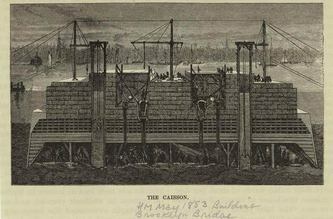 Construction of the caisson in May 1853. 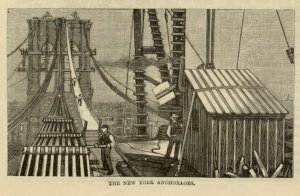 Construction of the New York anchorages. "Inside the caisson everything wore an unreal, weird appearance. There was a confused sensation in the head, like the rush of many waters. The pulse was at first accelerated, then sometimes fell below the normal rate. The voice sounded faint unnatural, and it became a great effort to speak. What with the flaming lights, the deep shadows, the confusing noise of hammers, drills and chains, the half-naked forms flitting about, if of a poetic temperament, get a realizing sense of Dante's inferno. One thing to me was noticeable - time passed quickly in the caisson." The completion of the two granite towers, which were held down by the strong caissons. When it first opened, the Brooklyn Bridge was divided into five divisions. As seen in the picture to the left, the bridge was comprised of two carriage ways on the outside, a pedestrian promenade in the middle, and two railways between the promenade and carriage way. 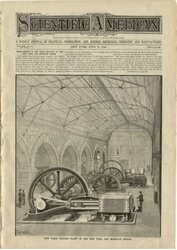 Two steam engines propelled the railway. 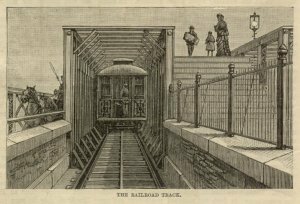 Reflecting a new industrial age for America in the 1860s, the bridge provided the means for Brooklyn trains to get to New York City. A rare video captured in 1899 by Thomas A. Edison of the train ride across the Brooklyn Bridge. Edison said, "This new negative showing the entire trip from Brooklyn to New York, in which the immense towers stand out clear and distinct in the sky. 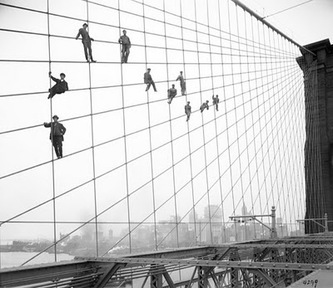 The best picture of the Brooklyn Bridge yet secured." Brief review of Brooklyn Bridge's innovative design.